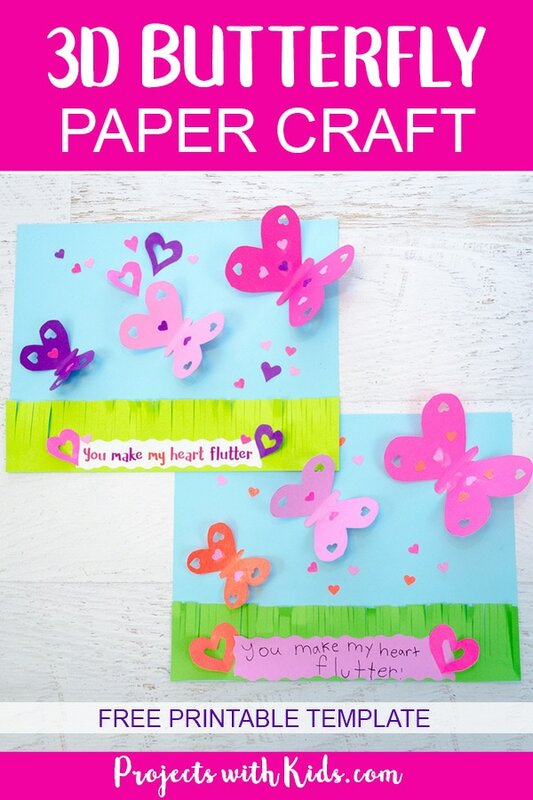 Bright spring colors and hearts fill this beautiful 3D butterfly paper craft that is perfect for Valentine’s Day, Mother’s Day and spring. 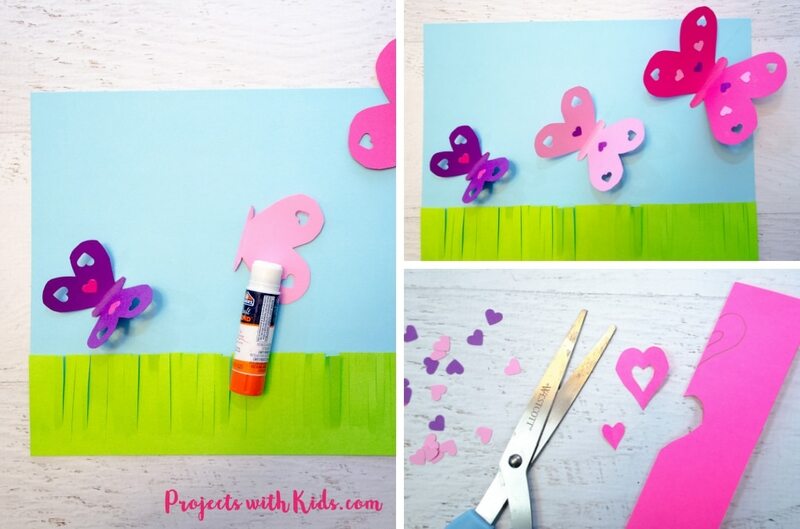 This craft is great for kids to practice their scissor skills and using the butterfly templates provided, makes it super easy. I love how the 3D butterflies look like they are flying off of the page and the blades of grass create such a fun texture. This template is available to use as part of my free resource library that is available to my email subscribers. Scroll down to the bottom of this post to get your template. 1. 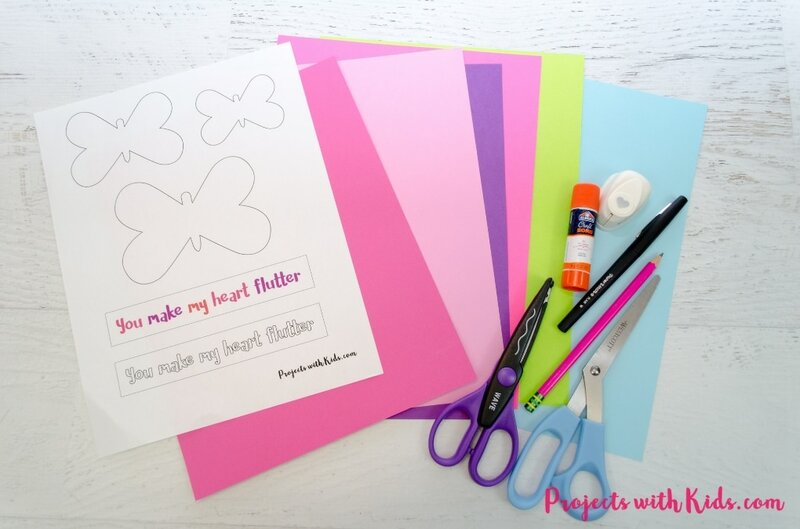 Print out your butterfly template on white printer paper (Scroll down to get your template). Get your colored paper ready. 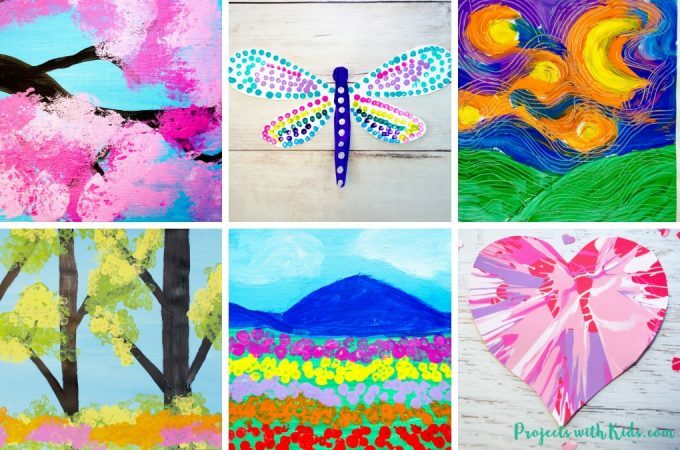 You will need blue for the sky, bright green for the grass and 3-4 colors for the butterflies and hearts. 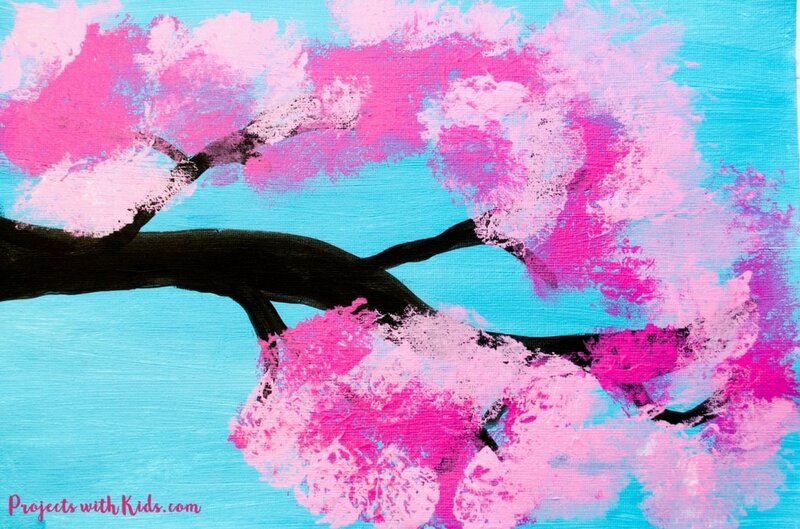 We choose purple, different shades of pink and a neon red. 2. Cut out a strip of green for the grass. Our strip was just slightly smaller than 1/3 of the page. 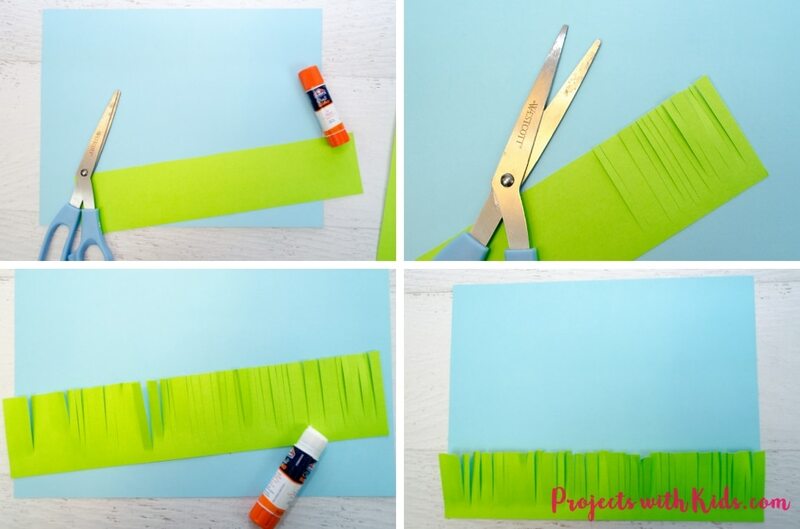 Cut small strips in the green paper for the blades of grass. Remind kids not to cut all the way to the bottom. This is great scissor practice for kids! Once the blades of grass have all been cut, use a glue stick to glue it to the bottom of your blue paper. 3. Time to make the butterflies! 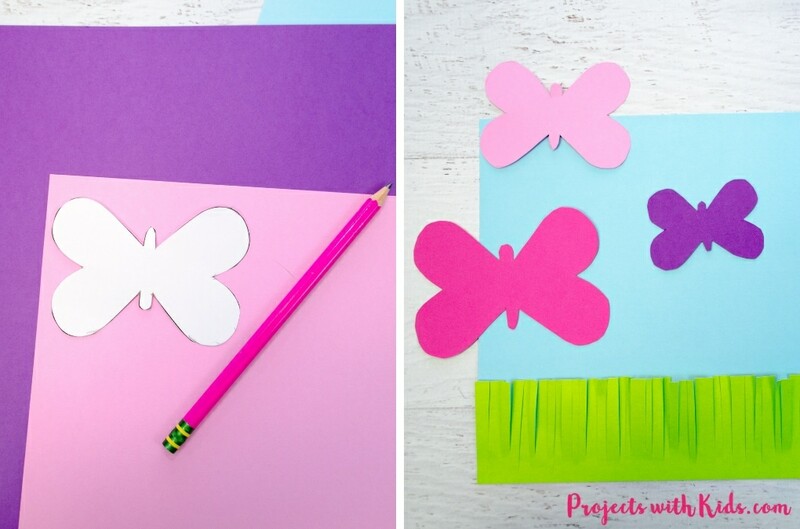 Cut out the butterfly templates and use them to trace and cut out your butterflies on colored cardstock. Carefully fold the butterflies in half. 4. 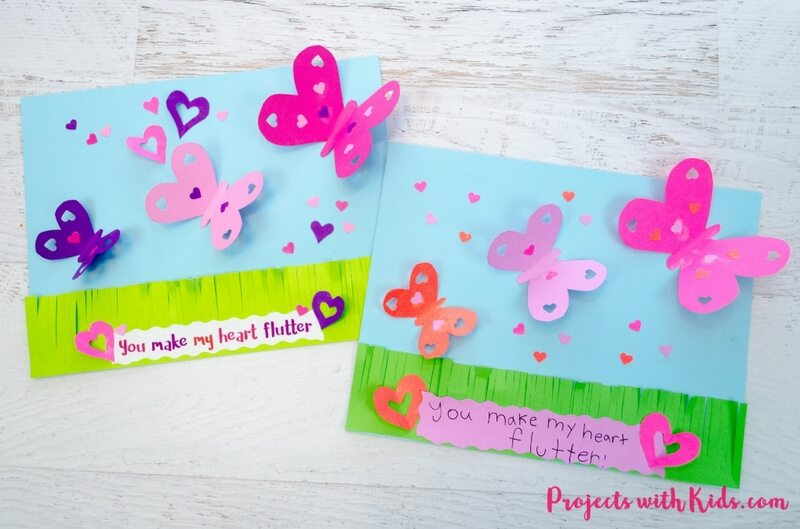 Using a heart paper punch, punch out hearts on the butterfly wings. Younger kids may need help with this step. To make it easier for kids to do this step on their own, they can unfold the butterflies and punch through one wing at a time. Glue on some paper hearts to the butterfly wings. 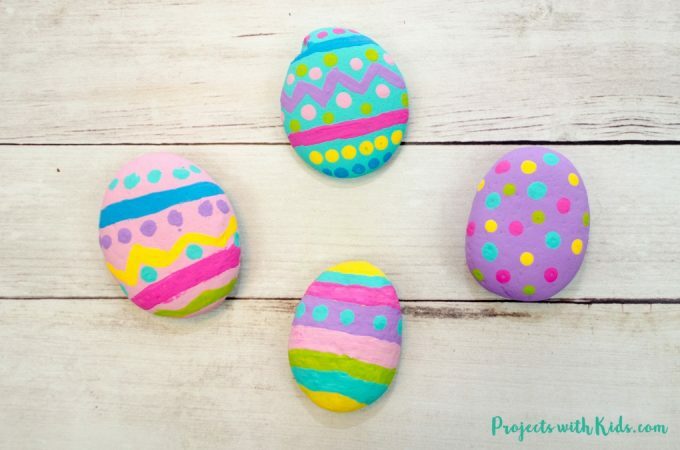 You can use even more colors here if you like to make the butterflies extra colorful. 5. Punch out some extra hearts to use on the blue sky and grass. 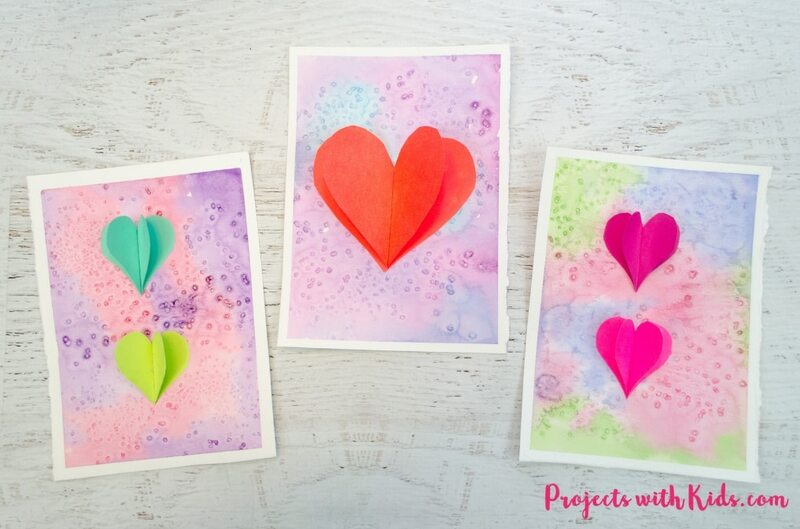 Make some bigger hearts by folding a piece of paper in half, drawing half a heart shape and cutting it out. I also cut out a heart shape in the middle of these hearts to add some interest. 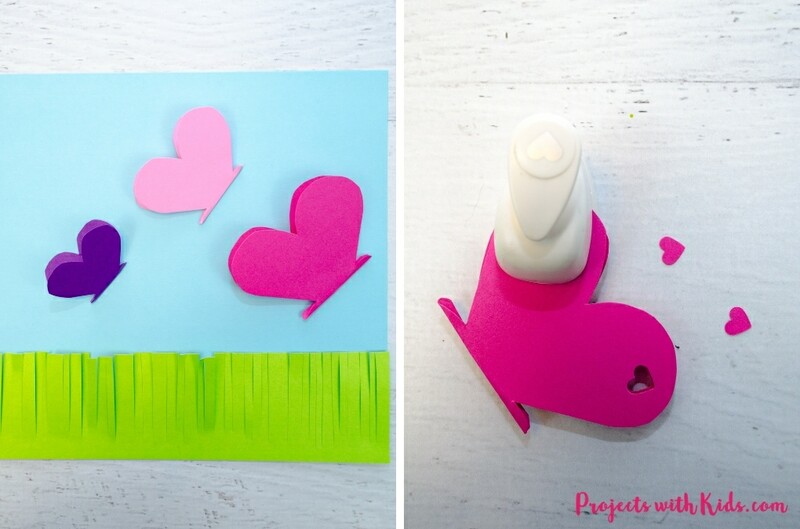 Arrange the hearts on the blue background and glue down with a glue stick. 6. 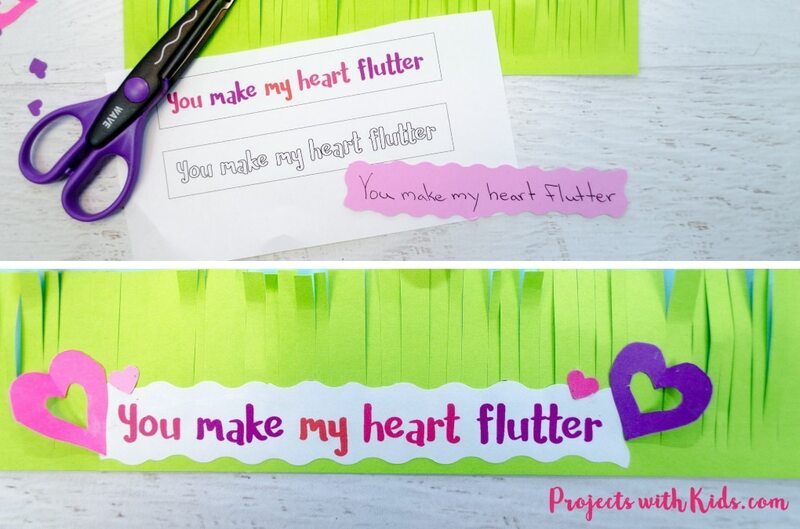 Make the “You make my heart flutter” label with one of the printable templates or have kids print their own. We cut ours out with fancy scissors. 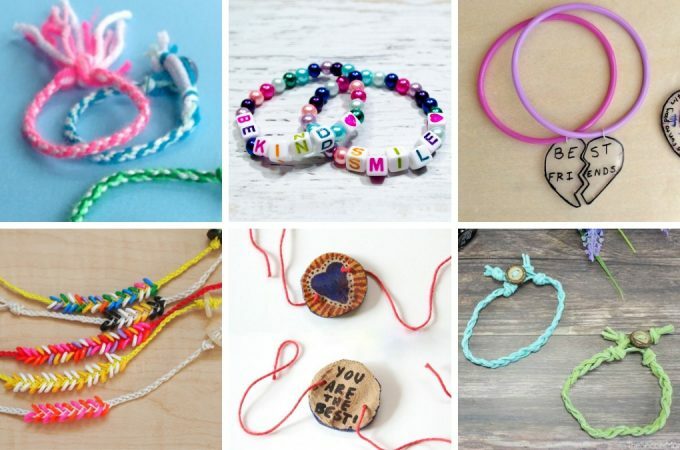 Glue it on the bottom of the grass and glue on some hearts around it. 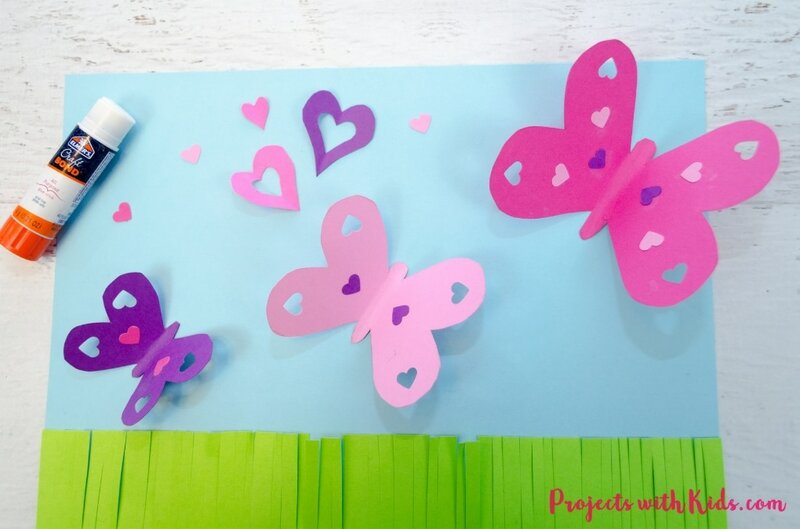 This 3D paper butterfly craft is a fun and easy project that kids will love making and creating for someone special. 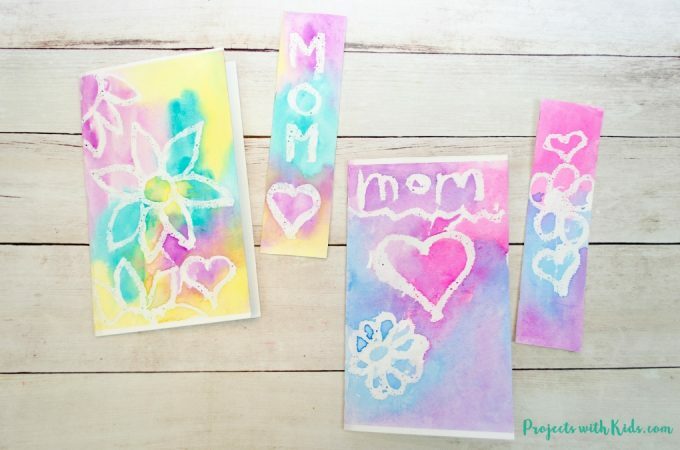 It would make a great Valentine’s Day craft, which is what we are using it for but would also work for Mother’s Day or spring. 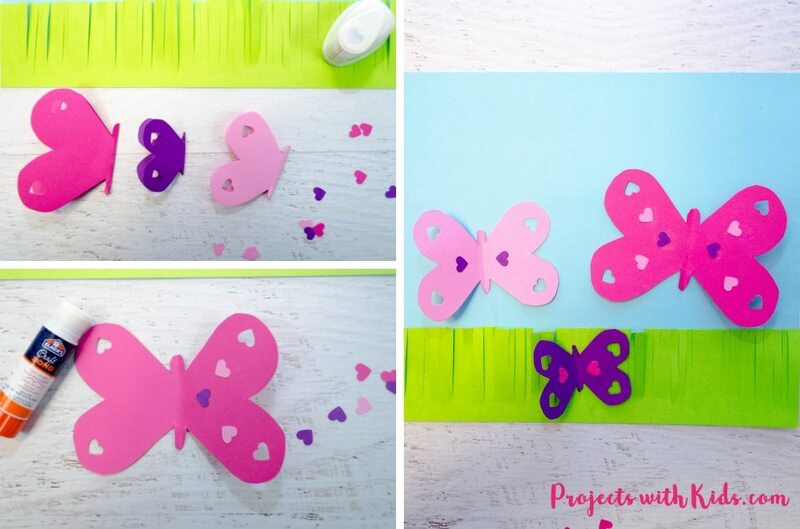 I love that kids can choose their own colors to use and decorate their butterflies to make this craft unique. You can get this template as part of my free resource library that is available to my email subscribers. After confirming your email address you will receive a welcome email with all the details. Click here sign up and receive your printable template. Una web fantástica! Felicidades por tanta idea maravillosa!